This was another test recipe for Isa’s brunch book. It’s a testament to how good it was that a) I was a bit drunk when I made it b) my measuring cups were in the dishwasher and c) I didn’t have quite enough plain flour and had to use some bread flour – and yet it was still the nicest waffle I have ever eaten. The whole house smelt like a gingerbread house; the waffle wasn’t sweet; it was just lovely and spicy. To add insult to injury, my husband realised it went really well with a glass of calvados. There was no going back from that point. 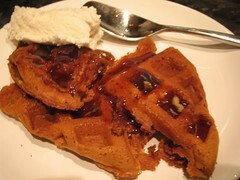 I served the waffles with vanilla Swedish Glace ice-cream and sorghum molasses. Yep, that’s right. I’d never heard of it either until the previous day, when the wonderful Johnp sent me a southern US care package. Southern US food really intrigues me. It’s almost as far removed from English food as, say, Chinese food. And when you don’t understand a cuisine, it’s doubly difficult to get to grips with vegan versions. The rest of the package includes 3 different barbecue sauces, grits, boiled peanuts, black eyed peas and hominy. And I know you are wondering, the sorghum molasses is wonderful, and perfect with the waffles. This entry was posted in Crack of Noon and tagged brunch, Crack of Noon, vegan by efcliz. Bookmark the permalink.